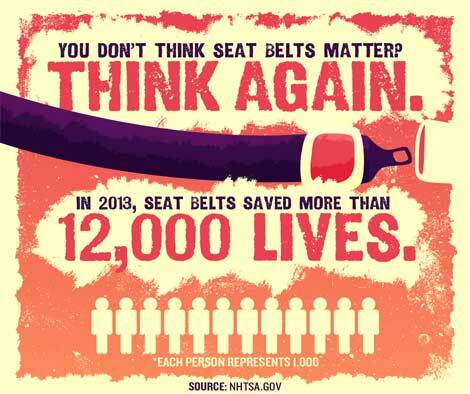 Monday, May 18, 2015 designates the beginning of a two week National Seat Belt Enforcement Mobilization. Law enforcement officers will be looking for motorist not wearing their seat belts in the annual Click It or Ticket campaign. Always wearing your seat belt is not only a good idea, but is required by law. This year the National Highway Traffic Safety Administration is putting the spotlight on night driving as a large percentage of fatalities occur between 6 p.m. – 5:59 a.m. that involve failure to buckle in. What type of vehicle: Whether it’s a compact car or a pickup truck, put on your seat belt! Where you are sitting: Front seat or back seat, always buckle up! Where you are driving: In the city or the country, safety belts are a must! To learn more, visit www.nhtsa.gov/ciot.